cooking Archives - Page 2 of 6 - THE OLIVE BLOGGER - Recipes your family will love! You will never need to buy a box of Bisquick again with this easy to make version! In fact, I recommend making a double batch and keeping in sealed containers or mason jars so you always have some on hand! I use it to make my delicious Garlic Cheddar Biscuits as well as anytime we want to make a Quiche! You can even use it when making waffles, pancakes, pot pies and more. It is less expensive than the store bought mix and comes together in no time…your welcome! You will never need to buy a box of Bisquick again with this easy to make version! Use for biscuits, quiche, pot pies, pancakes and more! Put all ingredients into a stand mixer and mix on low speed using the whisk attachment until it comes together. Use in place of any recipe that calls for Bisquick! We use it in biscuits, pancakes, waffles, pot pies, quiche etc! Garlic Cheddar Biscuits – Red Lobster Copycat! It’s time friends! I have wanted to share this delicious recipe for Garlic Cheddar Biscuits with you for awhile now, but I wanted to make sure it was perfect and completely from scratch! If you have never had a Red Lobster “Cheddar Bay Biscuit” then you won’t be able to compare, and if you have let me tell you, THESE ARE THE SAME THING and so so sooooo yummy! Now when I say “from scratch” I mean it guys (no store bought mixes here!) and I am even going to share with you how to make your own “Bisquick” to have on hand all the time so you can make these and many other goodies whenever you want them! I chose to make my biscuits a little smaller than you would find in the restaurant (I like more to go around!) but feel free to make em larger if you want! You also want to make sure you brush them with the garlic butter when you are ready to serve, otherwise it will make them soggy. I make the biscuits up to a day in advance and just quickly heat them before they hit the table, and you would never know they weren’t just pulled from the oven. 3/4 Milk I use 1%, use what you have on hand! 1/8 tsp Kosher Salt "pinch"
Using a stand mixer (or just your hands if you don't have one) combine the Bisquick mix with the cold butter and mix for about 30 seconds. You want the butter to still be noticeable, about the size of small peas. Add the cheese, milk and garlic powder and mix until combined (do not overmix it). Remove from bowl and gently mix with your hands for about 15 seconds. Melt butter with garlic powder in microwave, then add in parsley and salt. Using a pastry brush gently cover each biscuit with a generous amount of the butter topping! Make sure your ingredients are cold (butter, milk, cheese) it helps trust me! Also, you can use margarine (the biscuits will spread a little bit more) just make sure to measure it ahead of time and stick it in the freezer to get cold (about 20 minutes). Well, what are you waiting for?! These biscuits are so easy to make and really take no time to prepare, they are loaded with so much cheese and delicious garlic that everyone in your family will be reaching for a second or third one to go with dinner tonight. So go make yourself a batch of these delicious Garlic Cheddar Biscuits and let me know what you think of them. Garlic Cheddar Biscuits (Red Lobster Copycat! ).These biscuits are loaded with so much cheese and delicious garlic that everyone will be reaching for a second or third one to go with dinner tonight. Get ready to have your mind blown, this Butter Chicken Poutine is not your “normal” poutine recipe…no no, I decided to use Naan Bread as my fries! Oh ya, you definitely read that right, and you are going to want to grab a pen and make your shopping list now because this recipe is AMAZING! So, what sparked this GENIUS IDEA you ask?! Well, as part of one of my blogging groups there are monthly challenges using a specific recipe item or dish, in this case it was Naan Bread, we then create a dish and share within the group so that everyone can see what was created. When I first saw the idea I thought “Pizza! We do Naan Bread pizzas weekly in our house…so quick and easy…” but then I thought I wanted to go further with it and give you guys something you haven’t seen before. And that is exactly what I did! Look at it, so gloriously yummy! Not only is this recipe full of flavor, but it is actually really, REALLY easy to make too! The butter chicken is placed on top of the crispy Naan Bread (don’t worry I’ll tell you how to do this too) and then smothered in cheese and cilantro. What isn’t there to love about this dish?! Every single bite that you take leaves you wanting more…it’s a good thing this recipe makes enough to serve 4 dinner sized portions! There are a couple things I am already thinking about for the next time we make this too! First, I would love to try it with some plain Greek yogurt on top, or even some crumbles of goat cheese. I think this would give it a really nice tangy flavor! Also, I would love to try it with actual cheese curds (these are traditionally used when making poutine!). With that said, this dish is incredible just as it is, and I know you will love it too! 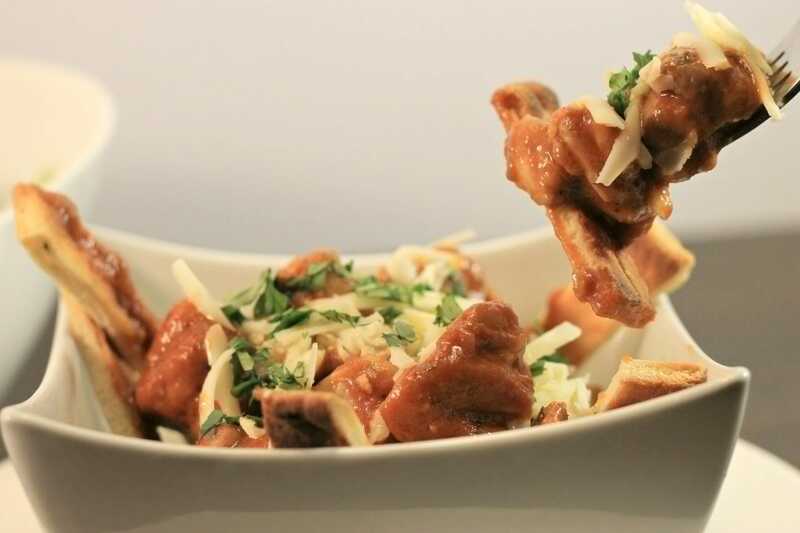 Butter Chicken Poutine with Naan Bread “Fries”! A fun and EASY twist on a traditional poutine using Butter Chicken!